Tucked away in the heart of Bavaria, there’s as much to see outside Munich as there is in the city itself. Make the most of the Alps by taking a cable car to the top of some of its prettiest peaks, or rowing across one of Germany’s deepest Alpine lakes. History buffs can head north to explore one of the best-preserved medieval towns, or visit Hitler’s mountainside escape. Just over an hour’s drive from the city centre is one of the deepest Alpine lakes in Germany. Its clear waters are almost 200 meters (656 ft) deep, and the lake itself covers over 16 square kilometres (six square miles)! it can be hard to take it all in from ground level, so drive up into the surrounding mountains for panoramic views back down into the valley. In summer, you can hire boats and pedalos, or just jump into the clear waters for a swim. You can also surf, sail, fish, and dive. Hikers should head over to the nearby Mittenwald trail to stroll through pine trees, and enjoy the views. Close your eyes and imagine medieval Germany… that’s Rothenburg! A little over two hours north of Munich between Stuttgart and Nuremberg, this walled town has some of the best-preserved medieval architecture in the country. It’s hard to imagine now, but in the 1300s, Rothenburg was Germany’s second-largest city. Take a walking tour around the ramparts, or head to the Medieval Crime and Punishment Museum for a glimpse into the past. Check the town’s website before your trip – there are often plays and festivals celebrating the town’s history. Equally stunning in its frozen winter state as it is in summer, this gorge was declared to be a natural monument in 1912. Visitors can go down inside the gorge and walk along the cliffside path that winds through the waterfalls. You will get wet, so make sure you’ve got the right clothes and some non-slip shoes. It’ll take you about an hour and a quarter to drive from Munich to the parking area, and you’ll need to walk for around 30 minutes before reaching the gorge itself. Right on the Austrian border is Hitler’s former mountain hideout. Presented to him as a gift for his 50th birthday, it was used for government meetings in the Third Reich. It’s now a restaurant, which you reach by taking a Charlie-and-the-Chocolate-Factory-style brass elevator 407 ft (124 metres) to the peak. Plan your trip carefully – its exposed position means that it’s closed between November and May. You can head there yourself, or join one of the many organised tours leaving Munich for a greater insight into the region’s dark past. 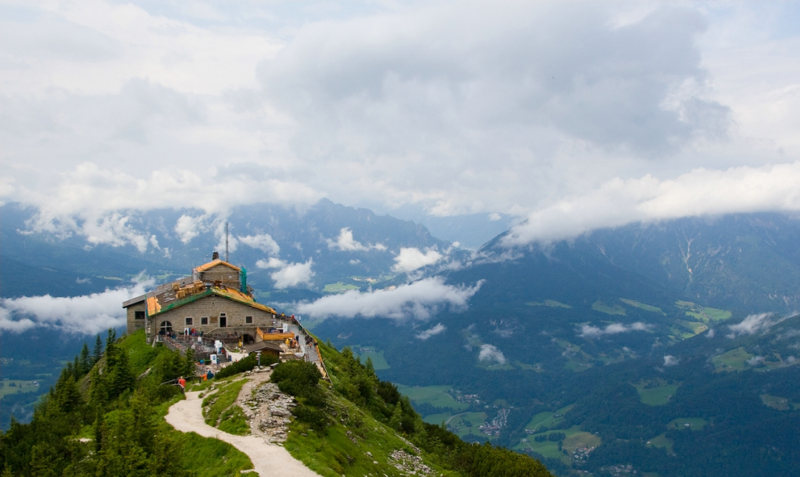 Kehlsteinhaus, 83471 Berchtesgaden, Germany, +49 86 52 29 69. Step back in time to the 1936 Winter Olympics! Hop on the slightly rickety two-person gondolas of the Eckbauerbahn, and admire the views of the enormous Olympic ski jump that’s still in use today. If you’re visiting in winter, make sure to relive some of your childhood memories by packing a toboggan for a speedy route back. Alternatively, head to the Berggasthof for a well-deserved beer and traditional Bavarian food. Perched on the edge of the mountain, you’ll have a 270° view of the Alps. Karl und Martin Neuner-Platz 2, 82467 Garmisch-Partenkirchen, Germany, +49 88 21 34 69. 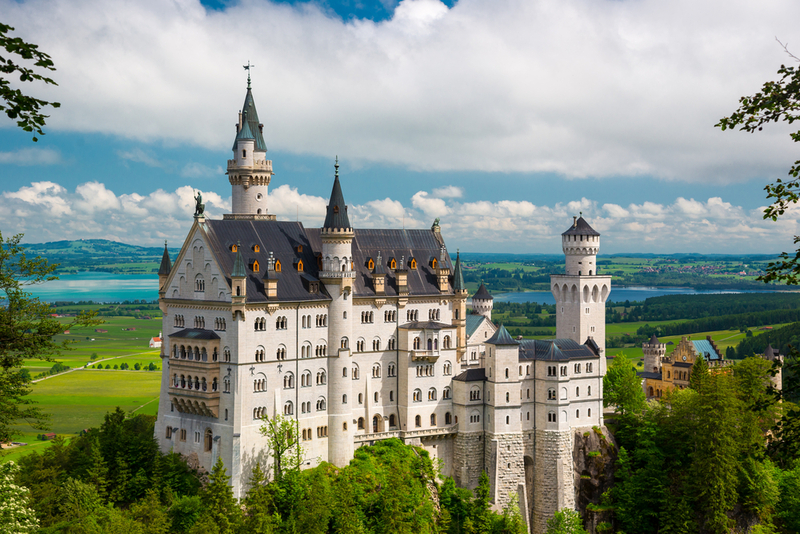 The ultimate Disney-princess castle is just an hour and 40 minutes from Munich. This nineteenth-century gem was King Ludwig II’s escape until it was opened to the public after his death in 1886. A tourist hotspot, over 1.4 million people visit each year to explore the castle, admire the view and take pictures. Make sure you buy your entrance ticket before tackling the mountain walk up to the castle, or – if you’re feeling lazy – complete the Cinderella experience by taking a horse-drawn carriage right to the front door. Neuschwansteinstraße 20, 87645 Schwangau, Germany, +49 83 62 93 08 30. This freshwater lake is the meeting point for three different rivers. 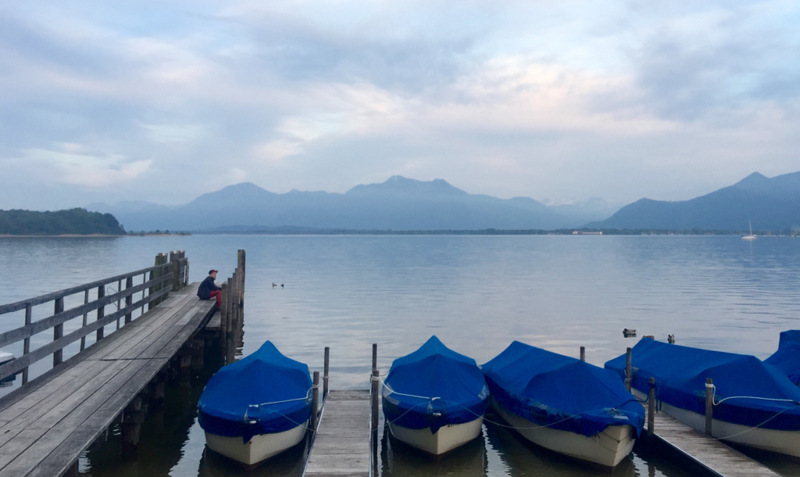 Hop on the S-Bahn from Munich city centre and you’ll find yourself at Chiemsee in around 90 minutes. Make sure you pack your swimming gear – right on the banks of the lake you’ll find Prienavera. This purpose-built complex has indoor and outdoor swimming pools overlooking the lake, as well as saunas and relaxation areas. Refuel before heading back to the city at one of the many lakeside restaurants. 83209 Prien am Chiemsee, Germany, +49 80 51 60 95 70. Pack your passport and head further afield; the advantage of being in south Germany is you’re right near the Austrian border. In less than two hours, you can be in the home of the Sound of Music – Salzburg. Wander around the narrow alleys of Altstadt, get gelato and admire the architecture in Domplatz, and catch the funicular up to Hohensalzburg castle for fantastic views of the city. Ready to relax after all that sightseeing? The monastery, Kloster Mülln, claims to brew some of the best beer in the country!